On this page we take a look at the Great Western Railway Air Service (1933) and its successor Railway Air Services (1934), and their mail carrying services. 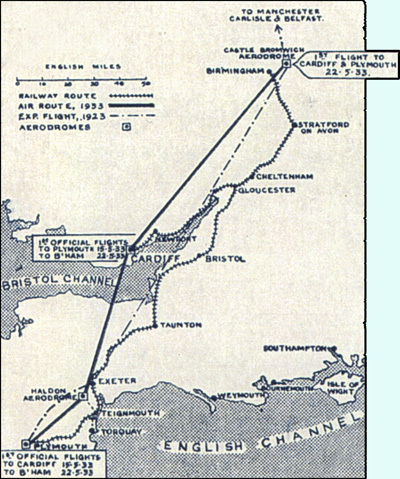 On 12 April 1933, the Great Western Railway started a daily air service to carry passengers and mail between Cardiff and Plymouth, calling on the way at Halden aerodrome (for Torquay and Teignmouth). The plane used was a Westland Essex six seater belonging to Imperial Airways, but repainted in G.W.R. colours. The G.W.R was allowed to carry railway mail under the Post Office Railway Letter Agreement, but it was unclear whether this permission extended to air mail. Post Office agreement followed on 15 May 1933. A few covers were carried on the first flight, charged at the railway letter fee of 3d each (for an item not exceeding 2 oz.). A green GWR 3d newspaper stamps was attached to each cover as proof of payment. 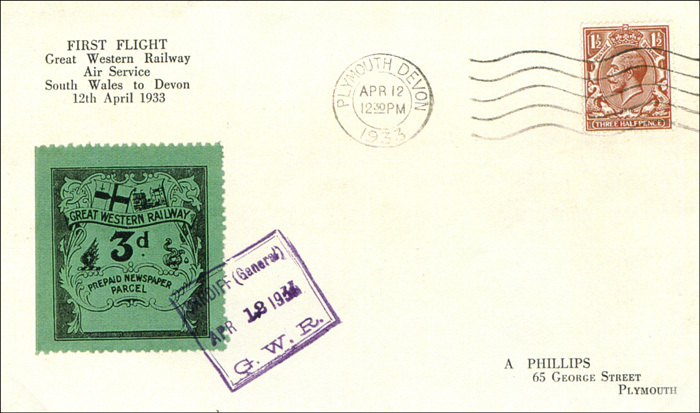 The following illustration shows a first day cover (with a 3d newspaper stamp) which was flown from Cardiff to Plymouth on 12 April 1933. 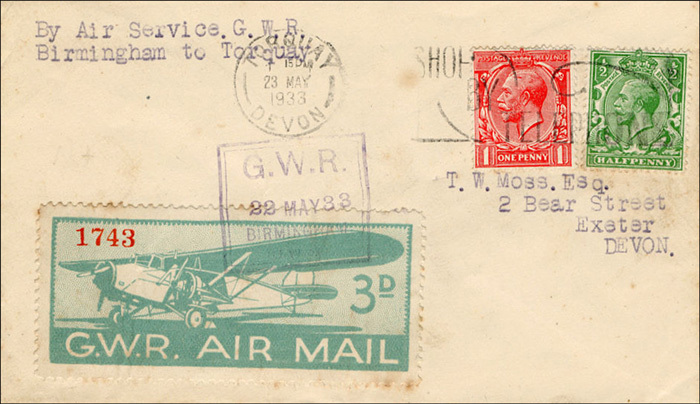 On the same day as the Post Office agreed that the GWR Air Service was legitimate (15 May 1933), they also agreed to the printing of GWR 3d air mail stamps to be used instead of the 3d newspaper stamps. 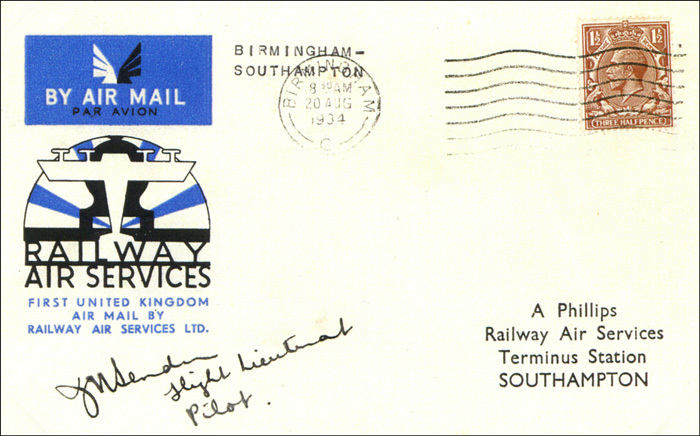 A week later the GWR Air Service was extended to Birmingham, and a first day cover for this service (with the new GWR Air Mail stamp) is illustrated below. The last GWR Air Service mail flight was on 30 September 1933, but because of fog it only flew from Birmingham as far as Cardiff. Operations were suspended for the winter 6 months, but the scheduled recommencement was overtaken by the events described next. On 21 March 1934, the ‘Big Four’ railways (LNER, LMSR, GWR and SR) came together with Imperial Airways to form the new Railway Air Services Limited (RAS). The airline’s main base was at London’s Croydon Airport (except that this was transferred to Liverpool Airport during World War II). 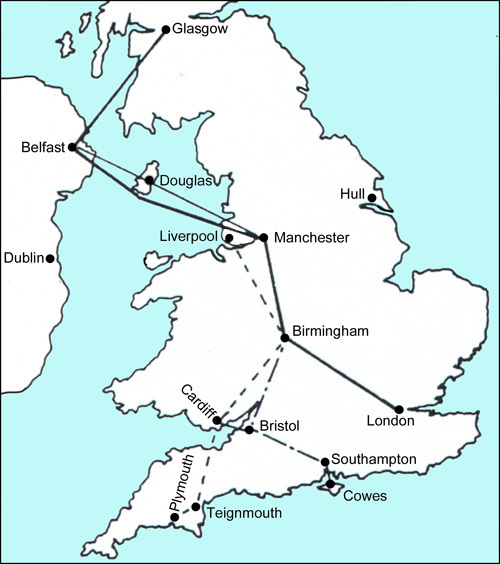 The illustration below shows the routes operated by the RAS shortly after its inception. Routes were subsequently expanded considerably. The Airline had a contract with the Post Office to carry mails at the same rates which applied to railway mails. The most important route was London, Birmingham, Manchester (later switched to Liverpool), Belfast and Glasgow, using the newly delivered DH.86 Express bi-planes. Illustrated below is a letter flown from Birmingham to Bristol (then carried by railway to Southampton) on 20 August 1934.